Norwegian singer Ane Brun possesses a voice that could be considered a natural treasure. On her latest album It All Starts With One, her delicate songs are set to a backdrop that mirrors her vocal versatility. Since debut album Spending Time With Morgan, her songs have always favored minimalist arrangements and sparse environments. It All Starts With One sees Brun stepping out of these safe surroundings. From spending time with her acoustic guitar, Ane Brun now moves effortlessly into grandiose settings layered with string arrangements and theatrical liveliness. With a rhythm driven and upbeat sound, this album, her eighth, shows Brun at her most experimental. 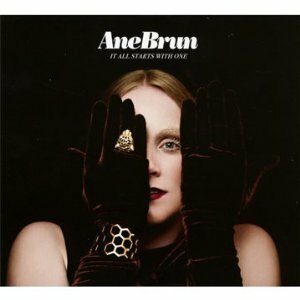 Ane Brun’s songs have always exuded a sense of melancholy, which also sets the mood on lt All Starts with One. The arrangements, however, allow Brun to highlight the different shades of her more quiet and withdrawn moments such as “Words,” “Lifeline,” and “Undertow.” With light percussion and guitar strumming along with a haunting piano, she creates a warm yet dynamic atmosphere. On “Worship,” José Gonzáles lends his voice and equally characteristic urgent rhythms. The first single, tribal drum spectacle “Do You Remember” is Ane Brun at her most danceable; a testament to the metamorphosis her sound has undergone.